My reference to time is the time needed to consume the food and beverage offering. Food is to be enjoyed, not thrown down your throat at risk of it being taken away! 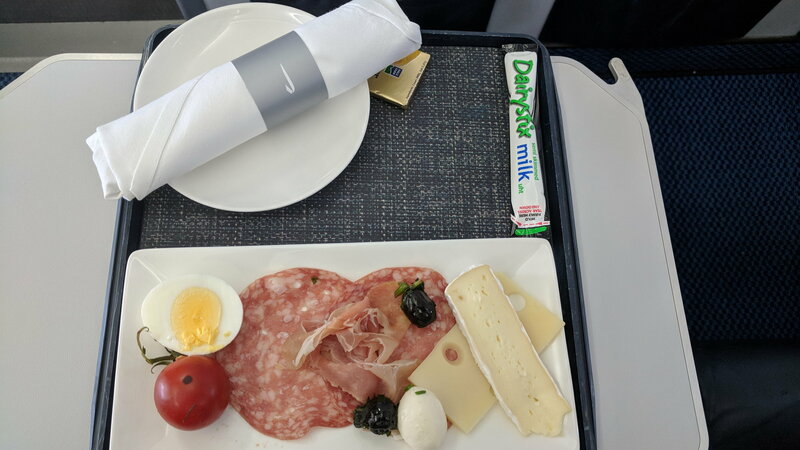 But that is exactly the point I was making: not just that it is served on QF but that it does not feel like a rushed meal from the point of view of the passenger, is enjoyable and there is well enough time to eat it leisurely. And according to everyone in my family I am a very slow eater!! Shortage of time is a poor excuse for poor or no service. I can recall a BD service when it was Diamond Service LHR-MME that was 26 minutes in duration from take off to landing. There was dinner - three courses on a tray, drinks and hot towels. The hot towels were distributed while the seat belt signs were on but it was all achieved. Looking at seat maps for QF short haul it appears there are only three rows of ‘proper’ J, as opposed to the magical moving curtain on BA. I’m guessing the service offered needs to be able to be consistently delivered at maximum occupancy. Exactly, the comparison is misplaced, two very different products. BA prices start at £220 on the route whereas QF prices start at £750 for their route. if you look at my earlier post again (no2307) you’ll find that I specifically mentioned that the usual disclaimers about different pricing, markets etc applied and also that I don’t personally find the offering inadequate on such a short route. Again I was simply reacting to one very specific point you made which was that there was not enough time to enjoy a full breakfast with which I disagree. By all means pay your additional £500+ for your eggs benedict, hopefully you'll get it down your throat before they are taking the tray away from you. Apples and oranges again here. We are discussing a CE service with less than 22 minutes service time (often significantly) less, in a cabin that is often more than 10 rows deep - unless you are sat in the first few rows there is simply not enough time to consume anything more than what is currently offered. Yes, BA could charge £750 for these flights and limit the cabin to 12 passengers and get everyone served within a few minutes of takeoff but that is not the BA proposition, that is not feasible at the price point. Comparing it with a very different, much more expensive Qantas product is a flawed comparison. There is simply not enough time for a busy CE cabin to be served, and for all the passengers to consume, a full breakfast. ah so your argument is that there isn’t enough time to enjoy a full breakfast as long as ba keep the ba way of doing things? A bit of a circular argument IMHO, a bit like saying a year that it’s impossible to make club world food enjoyable justifying that by their existing self imposed constraints at the time. As we now know and agree, it was possible to make cw food enjoyable by reorganising both service and costs and ba have. IMHO, the £500 is a red herring. It is a difference between the two services, but it is not a cause of impossibility. The majority of C pax on both LHR-MAN and SYD-CBR are connecting by the way so the price people (not me) are willing to pay on a o/d flight for the pleasure of flying C is irrelevant to them (us). The size of the cabin is another red herring in my view: QF also does it on SYD-MEL which is barely longer with 767s and BA used to do it for the entire 767 cabin on LHR-EDI with full three course meals in all Y config. Now it’s perfectly fine for you to feel you wouldn’t enjoy a different meal on that route, but it doesn’t mean the rest of us would not. lhrpete and hugolover like this. We are going round in circles and way off topic. orbitmic and EDIwanderer like this. Fair point! Sorry everyone for the OT. Have I missed an announcement that MAD is now in the long band? Just arrived on BA460 and it was a full hot meal (and a 777)! Ah good. Yes there was a post somewhere repeating what sounded like galley FM that MAD was going to join the Long band (and it made me wonder where else would be adjusted), but certainly there was previous speculations specific to this route. Good to see it happening. This is excellent news! Fingers crossed for Barcelona too. I'm doing PMI (afternoon tea time) and Barcelona over the next week and a bit so will report back unless somebody else beats me to it. Is this happening also on other flights?